Money is the fuel that helps local organizations do their important work. Extra money means that school groups can go on special trips. Donations allow service organizations to feed hungry people or improve public spaces. One of the ways that you can help your local community is by organizing efforts to raise funds for all of this work. Here are three fundraising ideas to get you started. 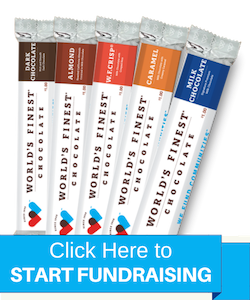 World’s Finest® Chocolate has always been a community-centric fundraising organization, and our new tagline, We Fund Communities™, stays true to our roots: who we are and what we represent. It is our brand promise. We are proud to partner with schools and organizations all over the country to help them reach and exceed their fundraising goals every single year. Now, as the #1 school fundraising company, we've added a new section of dozens of fundraising ideas to our blog. For nearly 70 years, World’s Finest® Chocolate has been a leader in fundraising. We’ve helped schools, families, and communities raise money to reach their goals. We’ve always been more than a fundraising company; and we owe it all to the 25,000 communities that put their trust in us. Our brand is well-known, but we wanted to make it more memorable and centered around purpose, fun, and extraordinary value. After raising over $4,000,000,000 (yes, that's billions) for schools and organizations across the country, World's Finest® Chocolate is going back to where it all began. In March 2017, after surpassing $4,000,000,000 in funds raised, World’s Finest® Chocolate CEO Eddie Opler – who is the grandson of Founder Ed Opler, Sr. - wanted to do more to acknowledge this spectacular achievement. What better way to do that than to pay tribute to our first customer? You've worked hard and successfully met your fundraising goals. Hooray! Now that your fundraiser has wrapped up, you may want to kick back, relax, and bask in your fundraising success. But before you take your victory lap, make sure you've done these four things after your fundraiser to set your organization up for even more success next time.